Hello guys, i'm looking for guidance on this build because i'm a novice when it comes to DIY LED. I decided to go with this route because light fixtures on the market that have cool functions but do not have enough power for what I want to grow. I am not willing to buy multiple fixtures to get the lighting power I need. I would rather build one fixture that can do the job. I plan to use pressurized CO2 with high lights. What I want from my LED fixture to be able to do is be able to transition to different modes of light from sunrise, mid-day, sunset, and moonlights (with cycle) all on its own based on the time. I looked at HurricaneX digital LED controller and that seems to be what I want in a light controller. I was thinking of using at most 7 channels. I'm hoping to get a parts list together. Then see what the total looks like for what I am after. If it is too much I might compare prices for certain parts or shop around. I've read a few DIY LED threads and they have been helpful in giving me some insight. There are questions I could not answer just by reading the threads because I couldn't figure out how they got their answers. I figured I was just a little behind on my research that I couldn't list all the parts or understand some vocabulary. Another thing I found is that some old threads had parts that I could not find online. 1. Do I need Drivers if I have a light controller? If I do how many? 3. When playing around in spectra is it best to aim for a neutral white to make fish color pop and plants? 4. Any reading material suggestions? 5. How likely is it to destroy a heat sink when drilling for holes? Small start.. Mixing large COB's w/ small colors is a difficult way to go. I've just used either all COB's or all single emitters..
Can be done but I still prefer small emitters..
Anyways it never runs "full power". Currently, as far as costs go, finding cheap reflectors (as opposed to lenses) is problematic. Rest of the parts are a piece of cake.. Cost is probably in the $400 range..Of course adding premium (above is a mix of premium and better than average grade) diodes will add to it..
COB's alone (like a ww/cw set) will be cheaper and there are cheap good "mini-COB's" also. One could go into color adjustable COB.s High CRI emitters, specialty chips,violet pump/integrated chips ect..
ChrisX's build is easily up-scalable..
May take a bit to wade through it..
@jeffkrol Would this be a good mix of LEDs? I think I am going to make two list one with pure LEDs and the other with a mix of COBs and LEDs. Then compare the prices and see which I like. I tried to upload the spectrum of a COB to spectra but I had a hard time doing it. I couldn't get the spectrum to flow smoothly even after following instructions on how to do so in another thread. I found it by searching through LEDs in DIY section. For moonlight, I want to go with cold white LEDs or just buy a moonlight strep from Stevesled. Well, you used old diodes. K series is like the "egg" style diodes. As to uploading spectrums yea it's sort of fussy. I took others advice and downloaded notepad ++ to do the cleaning work..
You need to watch commas and any blank or not correct bandwidths. Spectrum may want like 17 cyans but it is going to be visibly brighter to you due to eye sensitivity..
W/ dimming it's not an issue but adds unnecessary cost. Do you happen to have the link to the website that traces the spectrum curve? I downloaded notepad ++ ready to try it again with fresh eyes and brain. I lost the link and forgot the thread name that I got the link. So not sure if I got this right but with the website spectra we are looking if we have the number of color LED to satisfy the growth of plants. Spectra also gives us an estimate of the number of LEDs we need to achieve the level of light (micromol)? Then we make sure we have enough of the reds, blues, cyan and white to balance by dimming? I hope I got this right. I just drew how I would arrange the COBs and LEDs on the heat sink. I plan to tune the LED colors when they are hooked up to the LED controller so the color blends together in the tank. What do you guys think? Okay, so I have been comparing specs to COB and Cold light from StevesLED. Apparently the COB I want to use is weaker in comparison to the cold LED by about 30 lumens per watt. I think its safe to assume I will be going full LED. I do not want to spend too much on cobs that are not stronger than the leds I plan to use. I'm going to draw up some diagrams to show tomorrow. I used Hoppy's equation to figure out the number of leds I need for each row assuming I do four or three rows. It took me a couple of rereads for the information to click but it clicked finally lol. The numbers of leds I need according to the equation is 84 for 4 rows and 96 for 3 rows. I think I might shave a couple of leds because I don't want it to be blinding bright but not too weak. If you go w/ lower color fidelity COB's there are few single emitters that can match them..
Keep in mind lumens are also "center weighted" around green.. so chips w/ large areas outside of this will register low. "PAR" is a different matter..
More of an FYI of some of the more intricate things..
Point is low "lumen" lights can have higher "par" or "pur" values and "look" duller.. Thus people use "limes" which really is more of a human "optical brighter" than anything else..
A 100% "PUR" tank will naturally look dull.. and odd..
CRI values are typical for Decor Series Ultra, Decor Series Street and Landmark and Decor Series Class A products. CRI values are minimums for all other products. Minimum R9 value for 80 CRI products is 0, the minimum R9 value for 90 CRI products is 50, the minimum R9 value for 97 CRI products is 93. Bridgelux maintains a ± 3 tolerance on CRI and R9 values. Please note, the above is not the WHOLE story as to why high CRI diodes have lower watt efficiency. this might help to clarify it a bit. Grey is the lumen curve. There are more phosphors in the high CRI COB and that does decrease output efficiency...but you might get an idea where I consider it a fair tradeoff at times. More for single chip or limited color supplementation. IF you are wondering about my confusion its due to terminology.. The lumen is a significant entity: it measures the total amount of visible light emitted by a given source. All other measurements are based on the lumen. Yet .. see data sheet and sensor wavelenghts.. Note LUX is just lumens/area..
@jeffkrol So in other words lumen per watt is not a good indicator of choosing LED or COB? The spectrum that a COB or LED gives out would be a better indicator than just how much light each gives out. I hope I understood this right. If I did then the COBs I chose could still be viable. Lumens /watt is just part of the story.. It's a good indicator of photon flux not a good indicator of what wavelength of photons are fluxing..
Or what it "looks" like. All work and it depends on goals. This is a rough approx. of what your 2 together will "look" like.. 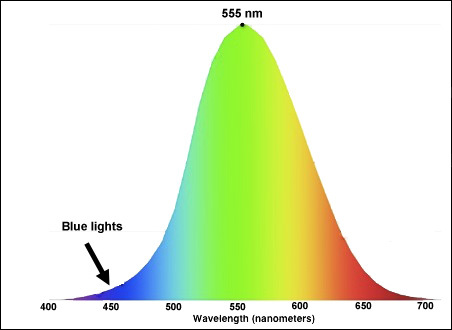 NOTE the Bridgelux 2700K has a lower lumen rating mostly due to the red shift out of the lumen "range"..
Also note CRI at 2700K is not measured to the same "standard" as CRI at say 5700k. Lumen "judgements" can really only be made between the same k temp chip with still keeping spectrum in mind..
Obviously measuring PPFD for each chip is a more relevent metric and to some even better to use "PUR"..